When I was a 6 year old boy, I remember watching on TV, the Rev. Martin Luther King Jr. deliver a speech at the Washington Monument. I was spell bound by his cadence, sincerity and confidence. Fifty years later, I'm not sure that I have ever heard a more inspirational speech. My heart still pounds when I hear the closing words of his speech, "Free at last, free at last, thank God Almighty, We are free at last!" My favorite part of the speech; however is when Dr. King shifted into the "I have a dream" refrain. He had used that refrain in four previous speeches, but it wasn't in the draft he had prepared for that day. As he read through his written manuscript, a voice from behind him began to prod the orator to go in a different direction. Gospel singer, Mahalia Jackson, encouraged Dr. King to shift into a new gear by saying, "Please Martin, tell them about the dream." Fortunately for us all, he paid heed to her plea. Today, we honor the Rev. Dr. Martin Luther King and his prophetic witness to civil rights and social justice. I search the horizon for future leaders who are able to speak God's word and inspire as he did and wonder when God will raise up one such as him. Until then, we do well to read his writings and listen to his speeches. 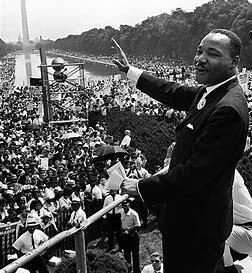 Here is one of my favorite parts of his dream: "I have a dream that my four little children will one day live in a nation where they will not be judged by the color of their skin but by the content of their character." God of Mercy and Compassion, we pray for freedom for all people in our world. Put an end to hatred, bigotry and prejudice and lead us in paths of righteousness for your name sake. In Christ our Lord, we pray. Amen.